Ariel Hsing is hoping to win one of two spots on the 2012 Olympic team at this week's table tennis Olympic trials. She writes "Let go, have fun!" on her left forearm during big matches. In my mind, I've played in the Olympics hundreds of times. I think the 2012 London Games will be my best shot to play for real. So I play at every practice as if it were the most important game in the world. And at every tournament, I try to play as if it were just another practice. This helps keep my nerves from getting the better of me as they did at the 2010 Youth Olympics in Singapore. I was so worked up, I trained too hard before the event and got a little elbow injury. That ultimately affected my game more mentally than physically. I was so nervous in Singapore -- I mean, really, really nervous -- that I couldn't stop thinking. And when you think too much, well, that's when you play your worst. And I did. I came in ninth. And before that, at the trials in 2008, I was too young (not even 12) to compete against the older girls. I just didn't have enough experience yet. But not this time around. When I first joined the U.S. Table Tennis women's team at age 13, I was one of the youngest players. Now a lot of the older players have retired and many of the junior members have moved up. At 16, I'll be one of the few veterans competing for two women's spots on the U.S. team at the Olympic trials starting Feb. 9. What I think will help me stand out, besides my speed, will be my sheer will. I'm known for fighting hard for every point. While the other girls are really good, too, and have more cool tricks and different skills, my best quality is that I don't give up. Even when I'm down, I'm definitely never out -- not until the final point is played. You never know what will happen in a match. This strategy of never giving up has worked well for me. I think it's because I was raised to believe that talent doesn't make a person successful. When I was 7 years old, I was told I had talent by a coach I met when I tagged along with my parents to a local table tennis club (they couldn't find a sitter that night). I later found out he told everyone they had talent. So I learned early on it wasn't a matter of being gifted. It's always been about hard work and dedication. After having lost two years in a row in the finals at the U.S. nationals, Ariel Hsing won her first title in 2010, becoming the youngest U.S. national champion ever. Afterward, I'll eat again and do homework at the club, then gear up for a second session -- and sometimes go for a jog to get in better shape – before heading home around 8 p.m. to do the rest of my homework. I've managed to maintain over a 4.0 GPA because my parents told me when I was in elementary school that if I didn't get straight A's, I wouldn't be able to play table tennis. So far I've kept up my end of the bargain, but it's getting harder now that I'm a junior in high school and I have to make time to study for the SATs in May. I need to do well on them because I'm not planning to play table tennis professionally for the rest of my life -- I hope to get into Stanford and study business, because I'd like to start a company someday. In the meantime, being able to whack that little ping-pong ball all the time really makes me happy. But don't tell the kids at my school, because when I play a tournament, I try to keep it low key. I hate it when people brag. So even if I make the team and play well at the Olympics this coming August, keep it on the DL, please. Ariel Hsing will be blogging for espnW throughout her training for the Olympics in London this summer. Check back in March for more on her journey. 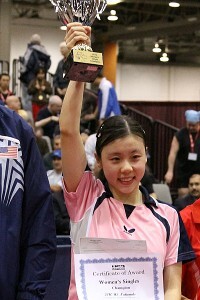 Ariel Hsing was the youngest U.S. table tennis national champion ever when she earned the title in 2010, at age 15. She won again in 2011, making her the heavy favorite for one of two women's spots on the London Olympic team.